Galway is well known as a creative arty city, so it is no surprise that it is producing a plethora of talented milliners of which Gillian Duggan is a leading example. The Renmore woman has really started to make a name for herself on the national scene in the past year and her intricate pieces are ideal for anyone wanting to make a bit of a splash at an upcoming wedding or racing event. Last year's Race Week in Galway was a very successful one for Ms Duggan when she was whittled down to the final ten in the country's most prestigious best dressed lady competition on Ladies' Day with a stunning blush pink outfit. Well known stylist and RTE presenter Marietta Doran gave her a huge boost when she wore one of her headpieces on the day, mentioning the designer several times during the broadcast. 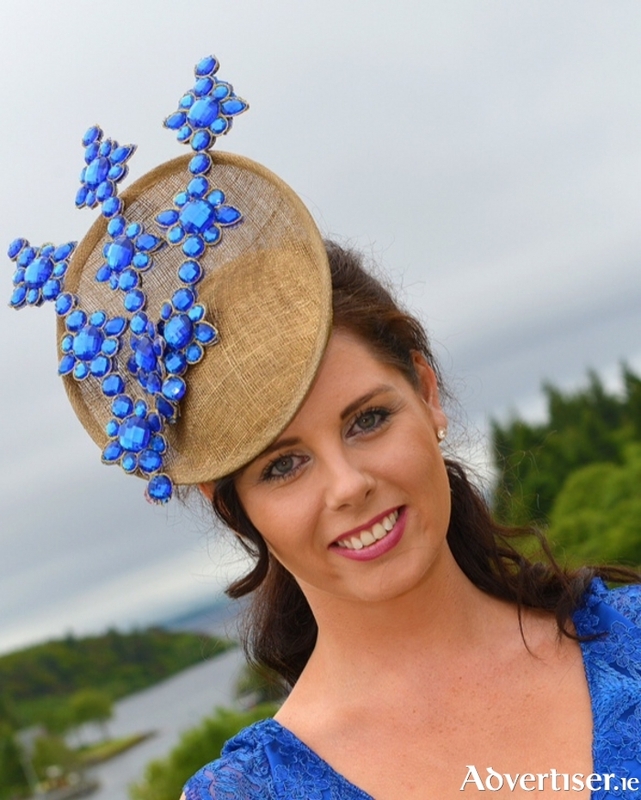 The 2014 best dressed winner Helen Queally Murphy, who has become well-known on the racing scene, also wore one of her pieces and she has a large online following due to her Facebook blog 'Daily Diva Diary.' It is this type of exposure that generates interest in the papers and on social media and really helps to get one's name 'out there'. The business is now going from strength to strength and the milliner recently featured on The Hat Show on Irish TV. The designer is already looking ahead to some of the bigger race meetings and is hoping to build on last year's success. "A few well-known people will be wearing my hats again in Punchestown and Galway, so I am really excited about that. It is nice to have your work be recognised." Many pieces by Gillian Duggan Designs are quite ornate and it is obvious she loves glitz and glamour, with embellishment, pearls, and sequins a common theme running through many of the looks. But she is certainly not a one trick pony and can make any shape, size, or design, with customers guaranteed they are wearing a one-off piece, which is hand finished. "I like to make only one of each piece, it keeps the brand exclusive and I don't want to lose that. From a commercial point of view, it would probably make more business sense to make ten of the same thing and sell them but I feel that if women are handing over hard earned cash, they deserve to have a piece that is unique to them and will not be seen on anybody else." She is a major fashionista who only started making hats and headpieces three years ago as a hobby, after she was unable to secure an appropriate piece for her cousin's wedding. Having always been creative, she was confident enough to enter the foray of hat making without any formal training. However she has since completed a number of courses to hone her skills. "I alway loved headpieces. I don't think I have ever attended a wedding and not worn a headpiece. Actually all my family are the same, we are the ones at a wedding who always stick out. I always like something a bit different and really struggled to find what I was looking for a few years ago when I was attending a cousin's wedding. I ended up spending a fortune on something that to be honest was really not that nice, so I just said, I am not doing that again and decided to try making them. I am very strong minded in that if I put my mind to something I will do it, so I ended up making my own and my two sisters' pieces and it just went from there." Having a hat mad family has not hindered her success in that she has plenty of ready-made models who will wear her pieces to different events, and who are not afraid to give an honest opinion. "I have four sisters so they will speak their mind and are never afraid to give feedback! Like it can be just commenting that a piece felt heavy to wear, and that is a big thing because I really aim to make stuff that is comfortable. If you are at a race meeting or wedding it can be a long day and it is important the piece is light, and does not slip on your head. All my pieces are now quite light, even if they actually look very detailed, it is about using the right materials. It is constructive feedback like that which helps improve quality." The great aspect about making headpieces is that they can be shipped anywhere in the world. "I'm really lucky to have so much support locally, with on-going commissions for weddings - both summer and winter. We are heading into the busy summer racing season and I have already got orders for Galway and am also picking up business abroad in places like Australia and Dubai where racing style is hugely popular. I put so much work into all my pieces, I begin to become attached to them and my biggest problem is letting them go!" There is a perception that one-off bespoke pieces are expensive but the designer can make to any budget. It is a personalised service and women are welcome to bring their outfits to the Renmore studio to ensure their head accessory is the perfect match. The right headpiece can be the crowning glory of any outfit. "You could wear a dress out on a Friday night but if you put a headpiece with that it can look completely different for a wedding or a more formal look. It's definitely the dusting on the top. It changes the way you hold yourself, the way you stand, it is a real confidence booster. Once you wear a piece that you get complimented on, you feel a million dollars. A lot of my clients have said to me that you feel so amazing, and that feeling becomes addictive and then you want to wear headpieces more!" + Gillian Duggan Designs is now stocked in a number of local boutiques including Don't Call me Dear in Mill Street, Ivy Boutique in Tuam, Muse by Dee in Middle Street, and F.A.B.U Liz on Newcastle Road. Her work can be viewed on Facebook, Twitter, and Instagram, and for enquiries, e-mail [email protected].